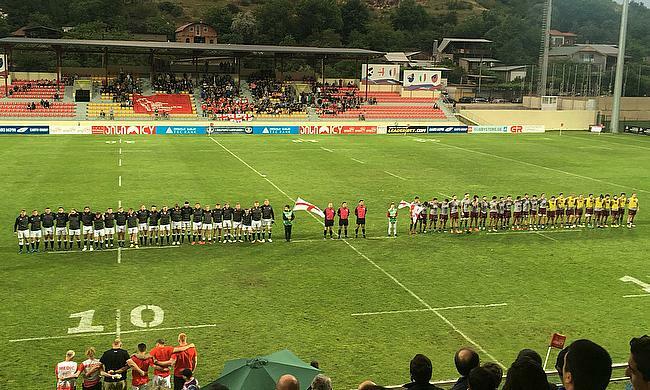 Fylde RFC player, Tom Carleton scored the winning try in the last minute of the match to secure a victory for his country against Georgia U20s. Arriving in Georgia on Wednesday at 5am and heading direct to their Martkopi base, the players went straight into a light training session, then video analysis to finish the day. Resulting in a limit down-time for the Englishmen as their Georgian adventure was just about to begin. With two more training sessions completed on Thursday and Friday, the squad was soon announced for their clash with an international side preparing for the World Rugby Under 20 Championship. Playing at the Avchala Rugby Stadium, Georgia went ahead first in the game through a penalty. Their lead was short lived as Yorkshire centre Connor Field scored a try following a sustained period of pressure. Fields’ score was converted from the touchline by Birmingham Moseley’s Sam Hollingsworth. England matched the Georgian physicality, undoubtedly making forwards coach, Paul Arnold, extremely proud of his players. Tom Carleton started to spring into life, receiving the ball after an England lineout and winning a penalty for his side. Hollingsworth calmly added another three points for his country to lead 10-3. However, the first half ended with both sides reduced to 14 men. Georgia’s blindside flanker and England’s Fitz Harding both receiving red cards after a fight broke out. The second half started just as England would have liked. Tom Carleton again instrumental in England increasing their points. This time, assissting Tom Briggs, the Billingham winger running in from twenty-two metres. Hollingsworth converted yet again. England were nearly the architects of their own downfall. Prop Ethan Priest was sin-binned following continued problems at the scrum, leaving the English with only 13 players on the field. Priests’ admission resulted in Georgia’s No. 8 rumbling over the line to put his side back in contention. Not so long after Priest re-joined the field, Oli Burgess was then sent to the sin-binned, leaving England with only 13 men to see out the game. Georgia soon took advantage of having an extra man, driving a maul over the line to bring the scores level and only four minutes until full-time. A mere two minutes later England had won the game. The prominent Carleton cutting through the Georgia players to score a try in the seventy-eighth minute and secure victory for his country. Sam Hollingsworth converted the try just to put the icing on the cake of England’s 24-17 victory. ...and then a moment of magic from Tom Carleton ? Before Fridays game against Georgia’s U20 Development side, Tom Carleton’s father, former British & Irish Lions and Orrell winger, John Carleton is due to present the players with their jerseys before their second test.